Life 101 : Happy Thanksgiving. We got a sprinkle of rain last night, but not enough to dampen deck. The early morning clouds moved off to the east leaving blue skies behind. We did most of the heavy work cleaning the house last weekend, so today it was all about the food. After coffee, Jilda swung into action baking a sweet potato casserole. Half of it was topped with roasted pecans and half with marshmallows. Our elder friend Lewis has problems eating pecans but he loves sweet potatoes so this was a good compromise. After that, Jilda prepared a 12-pound fresh turkey and started working on the dressing. I'd finished vacuuming, and doing my other assigned chores, so I took the dogs for a walk mostly to get out of Jilda's way while she worked. 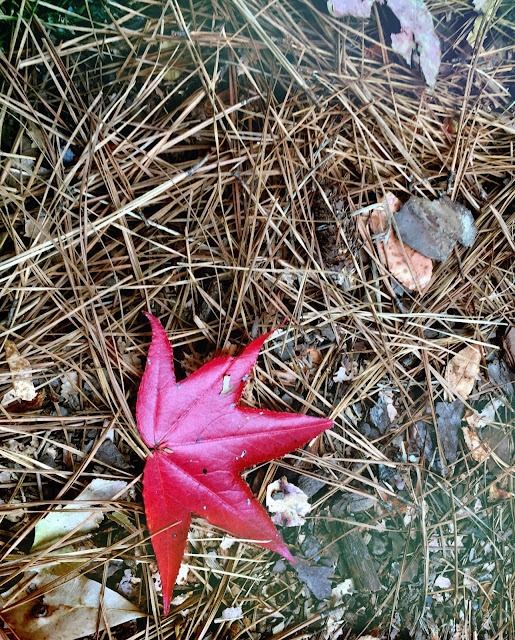 On one lap behind the barn, I saw the red sweetgum leaf on the ground. Snapping a picture, I posted it on Instagram with the caption: Red leaf in morning, Sailor take.....Well, you sailors know what to do. A few hours later, it all came together like the crescendo of a well-rehearsed orchestra. By the time guest began arriving just before noon, the aroma of Thanksgiving was in the air. We had 20 people here. Some were family, some were friends, and some were people we'd never met before today, but there's a good chance we'll become friends. I hope you've had a remarkable Thanksgiving. Sounds like a perfect day but I'm betting you both are tired tonight! Happy Thanksgiving to you both! Family friends and good food. An ideal day. How great that this holiday provides opportunities to make new friends. Take care, and Happy Thanksgiving. What a lovely Thanksgiving! You and Jilda work great together. How nice it is to make new friends. The red leather looking leaf is beautiful. Sounds great. I could almost smell the turkey and casserole cooking. Jilda B one smart cookie. Yep, I am sure you did your part. Good report.. Love it. Your Thanksgiving meal sounded wonderful! Gorgeous picture!